Global's TEAM Principles Stand out in Alaska Anode Project - Global Diving & Salvage, Inc.
Construction work and diving are two inherently dangerous professions by themselves, and when they’re combined on a job site the risk for injury or incident goes up. Teamwork, trust, and awareness are crucial to staying safe on the job. That’s why everyone at Global is trained in our TEAM principles – Together Everyone Achieves More. With safety, honesty, and hard work as our three common goals, we practice these principles every day on every job. Everyone at Global is empowered to use Stop Work Authority if they see something that puts anyone or anything in harm’s way. By being focused, aware and alert, we’ve kept incidents to a minimum and we work hard to see that everyone goes home safely every day. 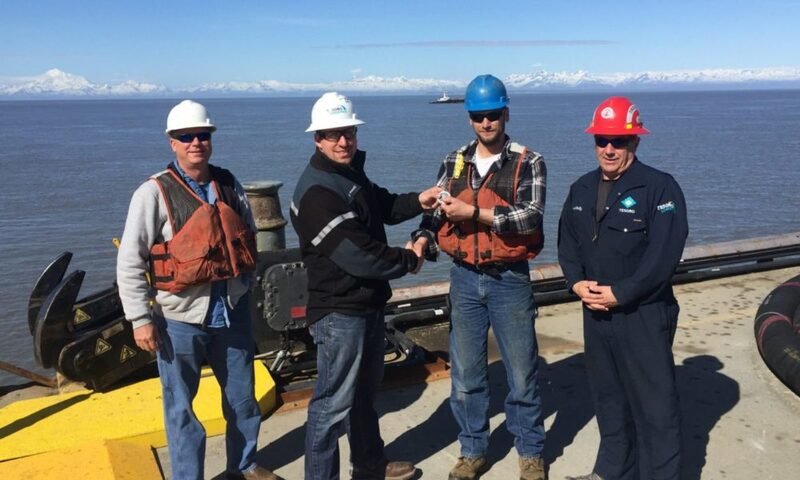 Global’s focus on safety was noted during a recent job for Tesoro in Cook Inlet, AK. Our team was praised on several occasions by the supervisors overseeing the project. Global was working in cooperation with six other contractors to install anodes and perform maintenance and repairs on a pipeline dock. The job went smoothly and finished up ahead of schedule, due in no small part to the teamwork between Global and the other crews they were working with. The supervisors noted the “exceptional” communication between the land and marine crews, the electricians and the local operations staff, especially considering how many groups were involved. Global’s Don Doan, Captain of the M/V Sand Island, was also mentioned for his adept skill piloting his vessel on the job. “His ability to put the boat in the most awkward of positions is amazing – a true master.” It’s a compliment not easily earned on the shifting, treacherous waters of the Cook Inlet. The biggest commendation of the project was Tesoro’s “Good Catch, Good Save,” awarded to Global Dive Supervisor Matt Ferrier, who called a Stop Work order when he noticed the positioning of some equipment could create a potential safety risk. Matt stopped the work, the vessels shifted to resolve the issue, and work resumed without incident. Tesoro recognized Matt with their “Hero” commemorative coin for his actions. We’d like to congratulate Captain Don, Matt, and the entire crew for their hard work and achievement on the project. Awareness, communication and taking action were critical on the Cook Inlet job, just as they’re critical on any job Global is a part of. We strive to look out for one another and work as a TEAM on every project, every day. It’s not just part of the job, it’s who we are. Great job Matt!! Way to go!